"...is a Boozer, a Dope Fiend and an All-Around Dead Beat." This rare collection of wanted posters from the American West, found in the basement of the Missoula, Montana, County courthouse, is a historical treasure. 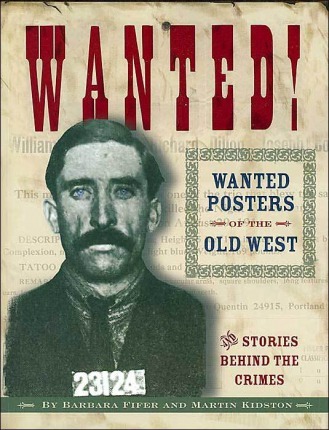 The book's nearly 150 original wanted posters, fugitive notices, and Pinkerton Agency circulars are supplemented by fascinating details about the technology of identification, the history of wanted posters, and the stories behind the crimes, from horse theft, jail breaking, safe-blowing, and train robbery to seduction, "white slavery," and murder. Posters for notorious bandits such as Jesse James, Kid Curry, Tom Nixon, and Butch Cassidy and the Sundance Kid are also featured. "Today's reader finds the wanted poster appealing out of curiosity about the past - about criminal types, personal characteristics, background stories. Delightfully, Wanted Posters of the Old West and Stories Behind the Crimes feeds that curiosity. It immerses the reader in instance after instance of startling derring-do. Moreover, it provides some case backgrounds - context - for the posters themselves. Who can resist?" Paperback, c2003, 206 p. : ill. ; 28 cm.